Baxter is a 4 year old Wirehaired Pointing Griffon. His nick names are Chubs and Big Boy. His favorite toys are “his babies” these were my stuffed, now unstuffed animals. His favorite treat is sweet potatoes. Opie is a year and 5 month old mixed breed, his parents say he is a mix of a lil bit of everything good. His nicknames are Opie Dopie, Opster and Ops. Cabibur is a 6 year old, smooth coated Saint Bernard. His nicknames are Buddy, The Big Dog, or our preference at DDG, Cali. 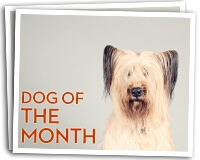 Daisy is our Dog of the Month for September, she is a 4 year old Maltese. Her nick names are Princess, Pretty & Baby. Her favorite toy is Foxy. Lucy is our Dog of the Month for August, she is a 1 year old Basset Hound. Her nicknames are Lucy-Goosey and Goosey Hound. Emmy is a 5 year old English Springer Spaniel. Her nicknames are Honey Bun, Sweetie Pie, Baby Girl & Toots.